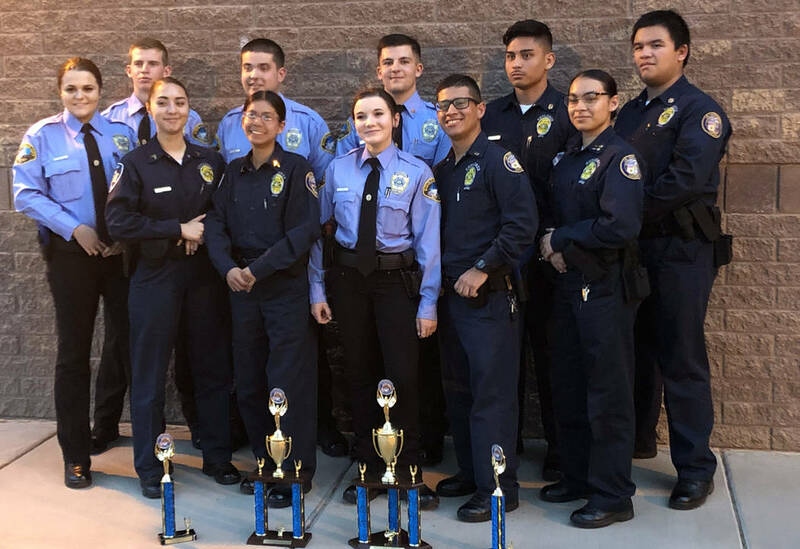 Boulder City Police Department Explorer Post 198 performed well this month at the 21st annual Chandler Explorer Tactical Competition in Chandler, Arizona, receiving four awards despite some changes to the group and the competition. Craig Tomao Boulder City Explorer Post 198 and the city of Las Vegas Marshals Explorer Post teamed together and earned four awards at the recent tactical competition in Chandler, Arizona. 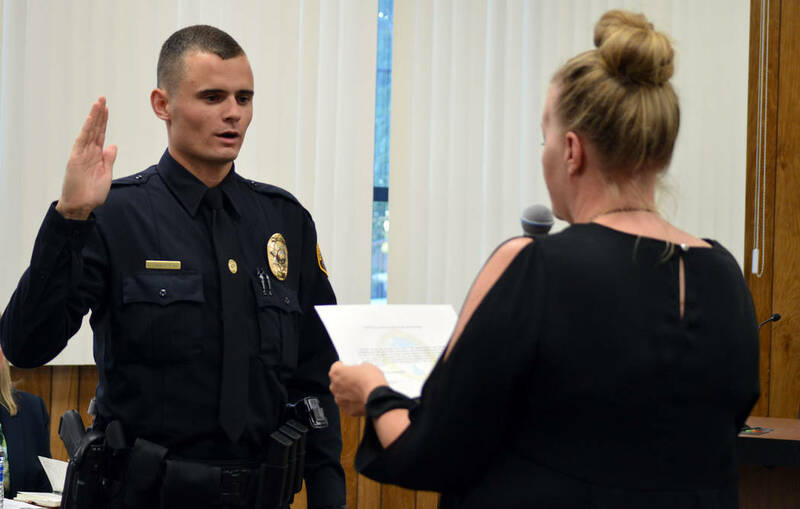 Boulder City Police Officer Giovanni Torcaso, seen at his swearing in ceremony in June, is one of the new advisers for the Boulder City Police Explorer Post 198. The post recently earned four awards at a tactical competition in Chandler, Arizona. Post 198 earned two first-place awards, one third place and a fourth place out of 60 teams from six states and 900 competitors. The team earned first place in the girls 3-mile run and first place in downed officer rescue. Its third place award was for the tubular assault event and its fourth-place honor was in tactical emergency medical support. The incident command category that Post 198 placed first in for the past two years is no longer part of the competition, according to Tomao. The tactical event offers more than 30 categories for Explorers. Boulder City has participated in the competition for six years, but partnered with the city of Las Vegas Marshals Explorer Post this year, according to new adviser Officer Giovanni Torcaso. Boulder City’s Explorers have partnered with other posts in the past and wanted to be part of a larger, joint effort. Torcaso said the combined team trained every week for five months prior to the competition in the categories selected. “They competed as if they’d been working together forever,” he said. Tomao said post members were also able to establish stronger bonds between them, the Southern Nevada Law Enforcement Explorer Post 6266 and a Las Vegas Metro’s Explorer post because they worked with them at the event. “We worked well with them together as a team,” he said. The Explorer post is an independent program, coordinated with the Boy Scouts. It is fully funded by donations from the community and its advisers. It helps youths learn about law enforcement careers and teaches them about leadership, community involvement and responsibility. Torcaso is one of Boulder City’s newer police officers and was part of the Explorer program. “It was eye-opening to see it from a different perspective. … You don’t fully realize how intricate the competition is,” he said about being on the other side of the competition. Torcaso was brought in as adviser to help fill a void left by founder and longtime adviser Boulder City Police Officer Scott Pastore, who is stepping down. Boulder City Police Officers Kevin Barakat and Kenny Calzada, both former Explorers, will also join the post as advisers.